Cheetah DVD Burner - Burn Audio, Data and ISO DVDs…Fast! Burn dual layer DVD+R, UDF Video DVD, UDF/ISO DVD, DVD+RW, DVD+R, DVD-R, DVD-RW, DVD-RAM, CD-R, and CD-RW discs. Burn audio CDs from WAV, MP3, MP2, AVI, OGG, and WMA files. Burn ISO, Bin/Cue images and create ISO images. 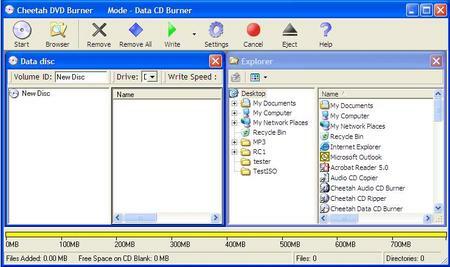 Erase CDs and DVDs. Copy audio and data CDs with one or multiple drives. 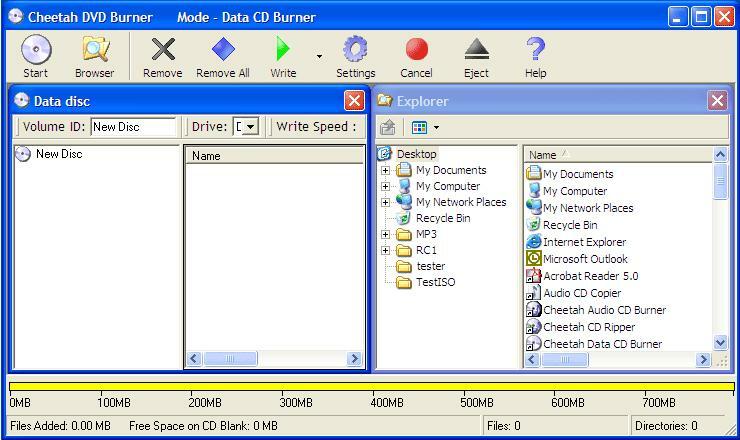 The Cheetah DVD Burner also includes an audio CD ripper. - Video DVD Mastering - The Cheetah DVD Burner passes the Video DVD Verifier tests and Mastering Applications like the most known Philips Video DVD Verifier. - ISO Multi-Session - Burn Multi-Session Data CD/DVD with all types of media. - Disc Finalization - No further writing is possible after the disc is burned. - Auto Verify Data - Performs a binary compare with the source files. - include unspecified updates, enhancements, or bug fixes.